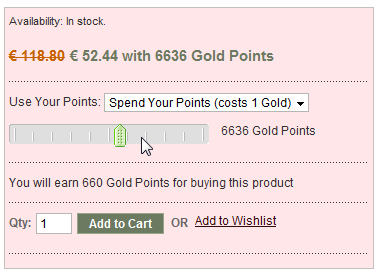 Multiple uses of a particular catalog points redemption rule will show the points slider. If the maximum number of uses is unlimited, the rule can be used by the customer a maximum number of times while the product price is at least 0 dollars. For example, if 1 POINT = $1-off, the customer would be able to use the catalog rule a maximum of 155 times to get a $155 discount if the product normal price is $155 (including discounts and special catalog offers. I've attached pictures of a rule configuration that will show the points slider below. You MUST apply rules and have an active cron job that is applying rules every day. 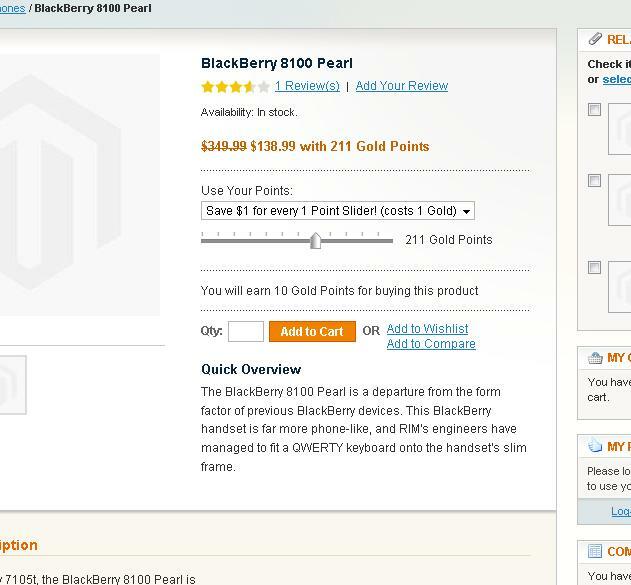 Also see the Shopping Cart Points Slider. To Skin the points slider simply modify copy skin/frontend/default/default/css/rewards/slider.css file to skin/frontend/default/ your_theme/css/rewards/slider.css and modify the image directories to point to your own images in your own theme's images folder (skin/frontend/default/default/images). "../../images/rewards/slider/slider_handle.gif" references relative to the theme the slider.css is in. The two main aspects you really need to skin are the slider rail and the slider handle. It is recommedned that you use PNG or GIF images to enable transparency. Here is a rule configuration that should show the points slider in the catalog product view page if MageRewards has been integrated properly.